This Century Cycling Short is supremely comfortable on long bike rides, imagine your comfort on shorter rides! The Aero Tech Designs' Thick Padded Century Cycling Shorts are made from a smooth stretchy fabric that feels cottony soft yet is a high performance polyester/spandex blend. It is a soft tricot knit with Lycra for stretch during exercise giving a complete freedom for movement. The short is very comfortable to touch and to wear. The Century Cycling short has a luxury, Italian thick chamois pad for bicycling comfort on longer rides. The fabric on the women's Century Cycling Shorts is specially constructed with smooth flat lock seams for softness next to the skin and easy stretch-ability. The waist is 1 inch wide with cover-stitched hems. The waist is on the high side so it stays in place and feels invisible once you start riding. Fabric is 83% polyester 17% lycra. Supremely Comfortable on Long Bike Rides!!! * Soft, non-binding silicone gripper elastic with a flat 3-step zig zag hem. The Century Bicycle Shorts' Thick Chamois Pad is Designed for your Anatomy. * Multi-Dimensional and Multi-thickness foam shape with wings for a stretchable Elastic Interface Technology chamois pad. * Perforated foam on the inside of the pad for maximum ventilation and comfort on the saddle with airflow and breathability. Ride the big miles you have been wanting to! Get Comfy with Women's Century Bicycle Shorts. Century Fabric was developed for cycling! The Century Padded Bike Short is designed for peak performance when cycling. To achieve that goal, we use our century fabric with an excellent chamois pad. Note to White Saddle users: This item may discolor your white saddle if you wear it before washing. : Machine or hand wash until water runs clear before using. Machine or hand wash multiple times until water runs clear before using. Always air dry; do not use a heated dryer. Please follow the same care instructions before wearing these with your white saddle. 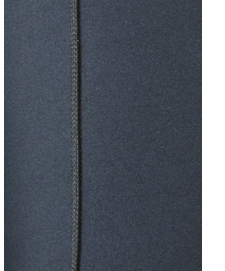 FABRIC: Our century fabric is a warp knit with a highly technical blend of spun microfibers that are rugged and durable. The fabric is knit with all way stretch ability. It has a high Sun Protection Factor and is very cool in the heat. The fibers are a blend of 83% polyester and 17% Lycra Spandex. The Lycra helps support your leg and hip muscles during the cycling activity. To describe the touch or feel of the fabric would be to relate it to a soft, knitted cottony material with a matt black finish. It is a lux rich feel that is not shiny or textured. The fabric has a cool and dry feel to it. LEG ELASTICS: The leg elastics are soft, non binding and feel like a second skin. They are silicone so they are soft next to your skin, they do not pick at your body hair and feel invisible once you start riding on your bike. 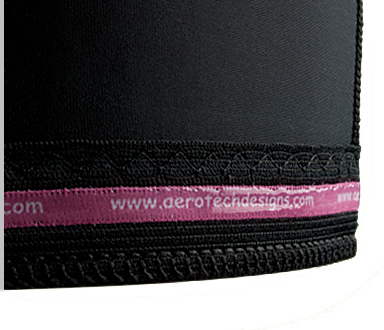 The elastic on the legs are luxury Italian knitted materials that function to keep the shorts in place when your ride. The legs stay in place and do not move while actively riding on long rides. The top stitching of the leg elastics are with a 3-step zig sag stitch that is stretchable yet perfectly smooth next to the moving skin. This means they leg elastics are highly functional yet very comfortable. To enhance the key performance indicators, we use all the softest stitching techniques. The waist elastic on this padded short is one inch wide non-roll. The waist is coverstitched with a flat, stretchable seam that hold the short at the waist. 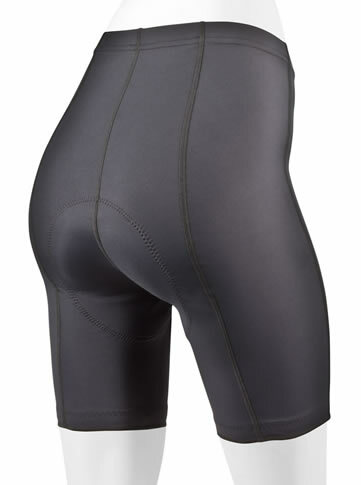 The shorts are fairly high in the waist so the back is fully covered in the bent over cycling position. All of the seams are as soft a they can be so that longer rides can be comfortable. Primary seams are flatlocked with a four needle flatlock stitch that is soft next to your skin. All of the sewn seams are flat as can be, plus the chamois pad is seamless. Women's Century Bike Shorts are designed for your comfort on long bicycle rides. Fit well. I am tall, they seem to be a little longer than other brands, which I like. Love these. Super padded, and kept me comfortable on a long ride. I also ordered a pair of the Luna's at the same time. Both shorts are well constructed, legs stayed in place and super comfy for a long ride. If you could put the Luna side pockets on these, I would have the perfect short. These have solved my chafing problem. I don't need Aquaphor anymore, even over 60+ miles. This work and fit great. I do let the thicker pad. Strangely, for once they ran a little big. Well made shorts. I am sending these back because I am not a fan of the stay put band at the bottom of the leg. Makes for a odd looking hem. I am F 5'7" 130-135 lbs, I don't like tight clothing but it obviously has to be snug. With Louis Garneau I wear XL so I ordered L...too big. Med fit much better though not tight. I could probably get S but don't like tight waist. So, sizing is close to American sizing. I wear size 6 usually. Performance is good. Did 70 miles on Sun. and was only starting to be aware of my seat by the end. Very comfortable and hold up after washing. I like that they do not ride up and keep me dry while riding. Very comfortable fit. Overall I like them except for the front doesn't come up to my waist like the other padded shorts I bought here. It always feels like they are falling off but aren't, just not made high enough in front. Padding is good. Not as impressed for the price and reviews. Padding not that thick as anticipated. That's why I bought it to have a REALLY THICK pad. I had to buy gel pad for bike seat for added comfort. I bike only about a full hour. Washed gently in cold water, mild detergent and hung to dry. Still mild shrinkage problem. Just wasn't as impressed after I had researched the ratings. I love my shorts! They're lightweight and very comfortable, definitely worth the money!! Normally 18 Plus size demin pant. Liked these a lot. Fits well, doesn't roll up Lands mid- thigh on shorter end of 5'5 woman. My only wish would be for more padding up the back/spine.. But, I am a newbie on this. I wore them once and found the material and pad uncomfortable. I wear a size 18w in clothes but found that I did not like the material at all and after washing them twice they were not a true black and the pad bunched up because the material was too soft and stretchy. I washed them twice and both times the water turned red not black. I wanted to live be them! I ride centuries and events ( the BCM Lobster Ride & Trek Across Maine, for example) and my previous bike shorts (Pearl Izumi) were getting very worn. I have an old Aero Tech bike jersey with a flamingo on it and loved it, so I thought I would give their bike shorts a try...........nice feel, nice fit and the padding, which might be a bit much for a younger rider, (I'm 60+) is fantastic! First time out, I rode and wore them 6 hours with perfect comfort! I will definitely be ordering another pair soon! Really pleased with the fit of these shorts. Have worn them cycling a number of times and it really makes a difference to the quality of my rides. Thanks for making plus sizes that fit. I actually wear them under my jeans and no one can tell that I am wearing them. Was very pleased with the fit and feeling of this pair of biking shorts. Still a bit tight on legs but not uncomfortable. Almost wish just a touch more padding through crotch area. So training for a half IM is starting to wear on all my nerves. But mostly those of my rear end. So I ordered these shorts. And well, Hallelujah. They are super comfortable, they don't chafe, they don't ride up in the legs, they don't bunch in the seat, the waistband stays exactly where it's supposed to be and not rolled over in a knot. And well the seat pad... yeah oh yeaaaah. It's glorious. I'm up to 25+ miles and no complaints. I've worn them in warm weather (70's) and cold weather (50's) and they were good in both temperatures. These pants are fantastic. Really. These shorts fit me perfectly and the pad is the perfect thickness, not so thick it looks ridiculous when walking. Similar to the Pearl Izumi Quest pad, but the waist on those shorts rolls down. This longer waist is perfect, does not roll down, the legs have ample room, the rubber grips are not uncomfortable. They also run true to American sizes. I returned the Xl for a large which fits perfectly (Amazon also has these on Prime, same price with free returns, wish I'd seen that earlier). I am 5'4", 166 lbs with a slightly thicker waist than fanny. I've tried Pearl Izumi, Belroy, Sheebeast and another, these are the best! Not only is the pad great for long rides, but material is different from any other short I've owned; it's delightfully soft. They are my favorites by far. The fit/design is good. The chamois does the job. The only negative for me is the length. I prefer a shorter leg length. These fit great. I only wish the band of elastic in the leg was a bit wider and tighter. Hope they are as advertised because my first century ride is approaching.. Normally, I buy higher priced shorts with thicker padding, but having outgrown my existing supply (oops! ), I tried this short. So far, so good. They are comfortable, not "see-through" but perhaps the pad does not fit perfectly. Pad fit is highly personal as everyone knows. 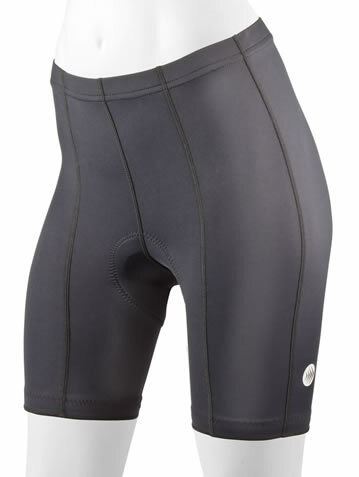 If you are riding 20 plus miles, these thick padded bike shorts do the job. I bought these shorts just before 9 days of TransAm touring. Cycling anywhere from 6-10 hours a day. Fit was great and helped keep my backside from being too awful sore! Very comfortable. Supportive but not restrictive. I don't know I have them on. Bought them to relieve sitz bone discomfort and the pad has really helped on 40 mi rides.